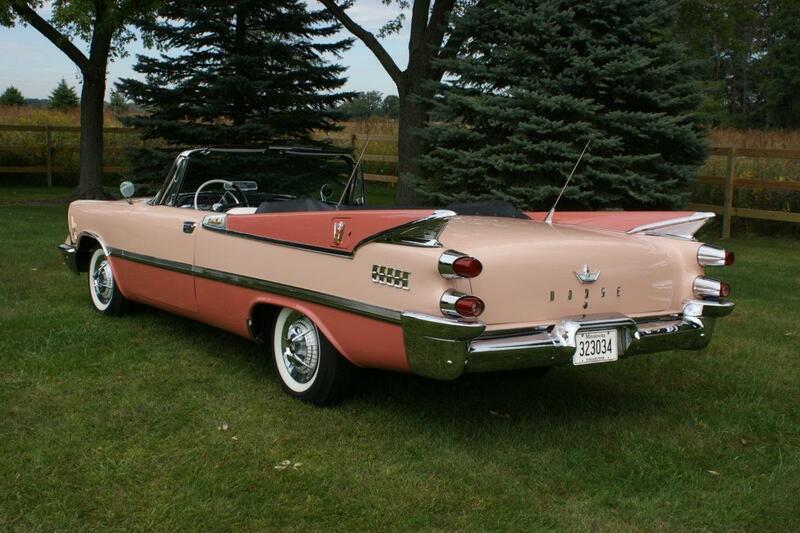 Wrapping ‘50s automotive engineering advancements in packaging inspired by space travel, jet aircraft and painted with a pallet of bright pastel colors, reached the pinnacle of perfection in 1959 with the production of the Dodge Custom Royal Lancer Convertibles. 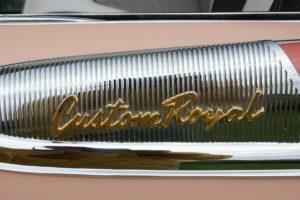 The end of the ’50 also marked the end of the era of flamboyant design, making the Dodge Custom Royal Lancer Convertibles the icons of the age and the last of their kind. In ’59, of the 151,850 Dodges built, 16,550 were Custom Royals, 984 of which were Lancer convertibles and fewer still came with the 345 HP Super D 500 engine. 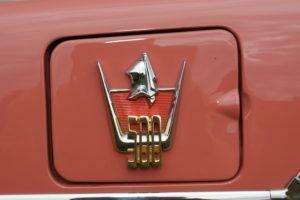 Only 5 to 10 of these magnificent milestone cars are known to have survived the ravages of time. The extraordinary masterpiece on display in the “Ken Nagel Collection” is an extremely rare example that features both the dazzling Rose Quartz and Coral Special Two Tone paint scheme and the new, powerful Super D-500 383 Cu In 345 HP “Wedge” V8 engine. 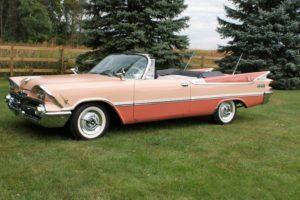 This stunning car rolled off the line, factory finished in shimmering Rose Quartz/Coral, on March 2, 1959 at the Dodge Main Plant in Hamtramck, MI (Detroit). Ken’s car somehow found its way to Mexico where it was discovered missing the engine but otherwise intact. While in Mexico, where the dry climate provided some protection from total devastation by rust, it was used as a “pick up” to haul rocks. Sometime in the 80’s the car was rescued and acquired by Bo Malefors of Phoenix, AZ, a recognized authority and restoration expert on Custom Royals who never got around to putting the car back together. In 1994 Larry Swedal of Elk River, MN acquired the derelict from Malefors and took the first step on what would be a long, challenging scavenger hunt and reconstruction project. 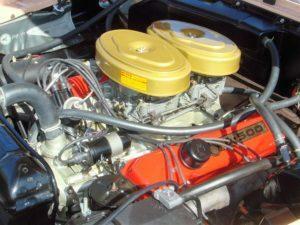 In 2010 Larry completed the restoration which included the installation of the, new for ’59, Super D-500 “Wedge” V8 engine. 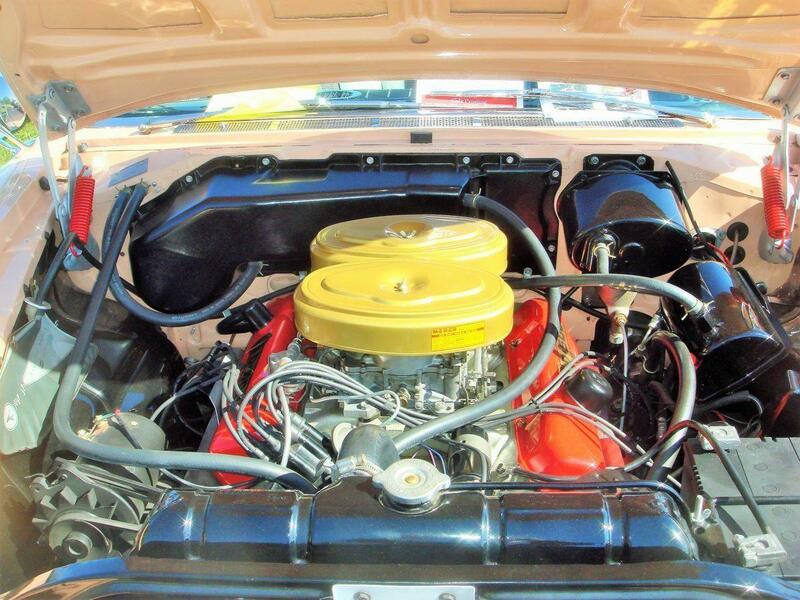 With 10 to 1 compression ratio, period correct dual 4 barrel Carter carburetors, intake and linkage, the 383 Cu In V8 generates 345 HP and an incredible 425 Ft. Lbs. Torque. For the next few years Larry drove and enjoyed the car taking it to several car shows where it never failed to win the top awards. Ken Nagel acquired the car in 2014 and a year after, although it was stunning to look at, it was beginning to some wear and tear indicating a major refresh was in order. Unfortunately, close inspection revealed a pressing need for a complete frame off rotisserie restoration. Bob Baker of Old Coach Works Restorations in Yorkville, IL was commissioned to undertake the restoration. 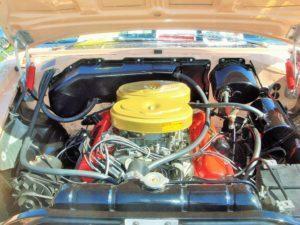 Few parts were needed as the original car was complete and authentic. However, an extensive amount of hand metal fabrication was required to make the body sound again. The top and operating mechanism were replaced and reworked by John Mayer from Ogden Top and Trim, Berwyn, IL., one of the best top and trim shops in the country. 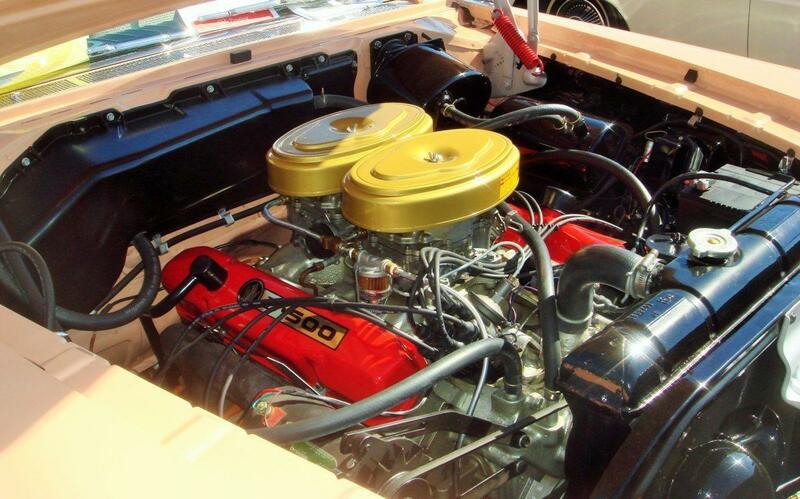 With additional assistance in the form of advice and parts from the foremost expert on ‘50’s Dodges, Bo Malefors at Copper State Classic Cars in Phoenix AZ the 2 ½ year restoration project was complete in the summer of 2018. The result is nothing short of stunning. The paintwork, body panel fit and finish are almost better than original. 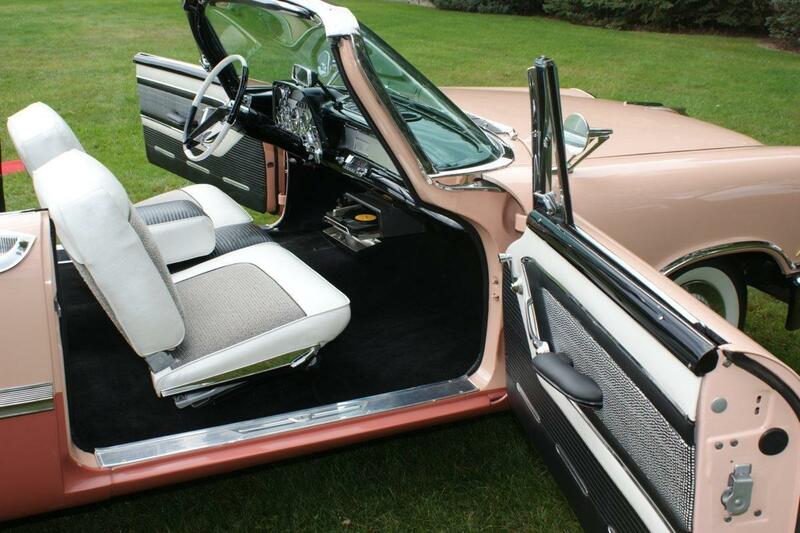 The underside is jewel like, the engine compartment is sparkling, the trunk is spotless and the interior with its swivel seats and glittering dash is luxurious. 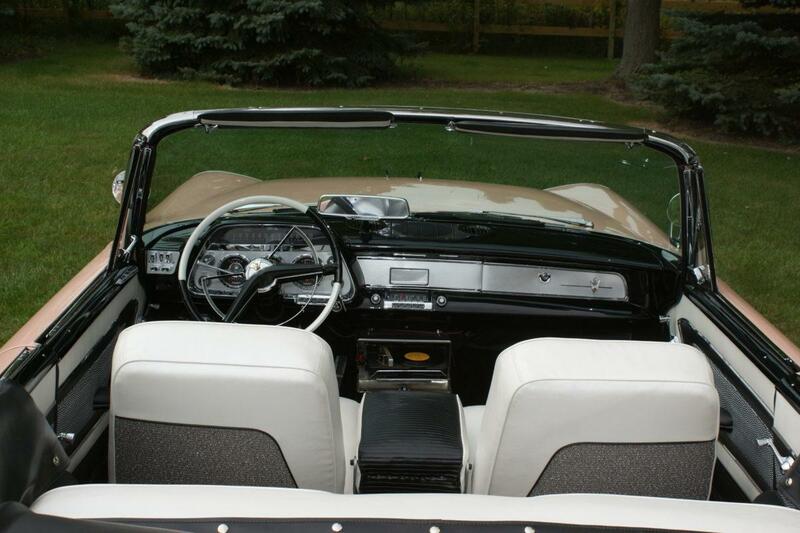 With a “loaded” price of $4,768.65 for the convertible, Custom Royal owners could have the potent Super D-500 engine for $446, along with popular options that included swivel bucket seats, 6-way power seats, push-button radio, electric clock, dual exhaust and a TorqueFlite automatic transmission with push-button controls. 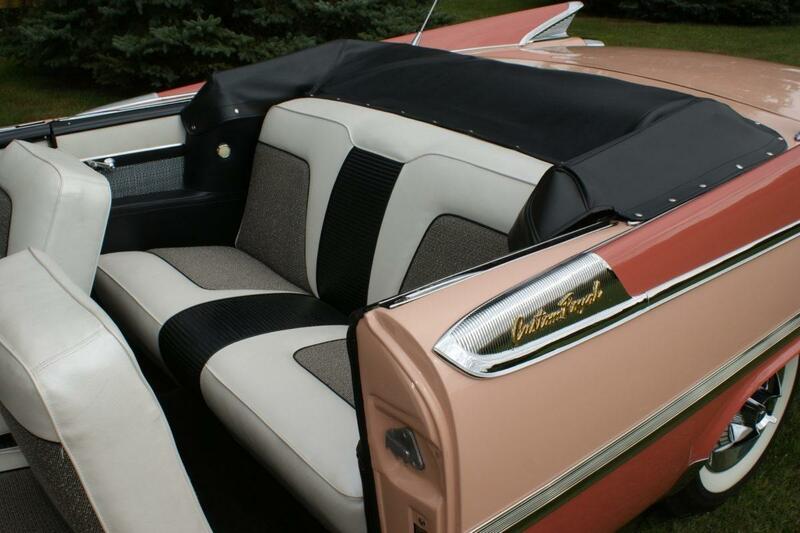 Set off by bright full-length body-side moldings and shiny fin edges, the ‘Special’ Two Tone Paint options, with exotic names like “Canary Diamond”, “Star Sapphire Blue Metallic” and “Paris Rose Metallic” were available for an extra $27. The interiors were no less ornate. 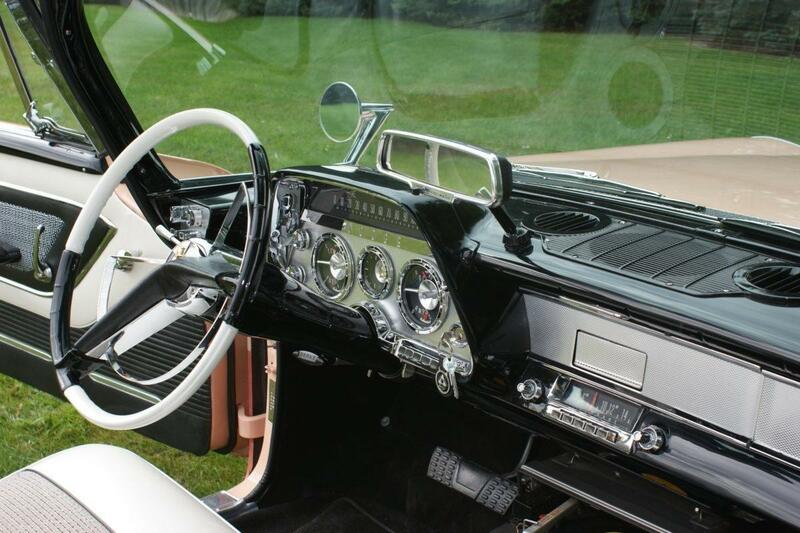 The huge steering wheel featured a thick horn ring, engine-turned plating surrounding the flashy gauges, the all-new ‘IndiColor’ ribbon speedometer changed colors as speed increased and cloth inserts jazzed up the upholstery. 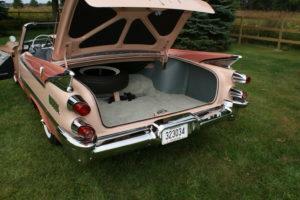 Swedal even added a Highway Hi-Fi record player, which was offered in ’58 but not available from the factory in 1959. The boxed side rail full perimeter frames with five cross members (plus an X-brace for convertibles) were the last Dodge produced. Combined with 425 Ft. lb. of torque from the 5 main bearing V8, Torsion-Air front suspension and rear leaf springs the big 3,820 lb. 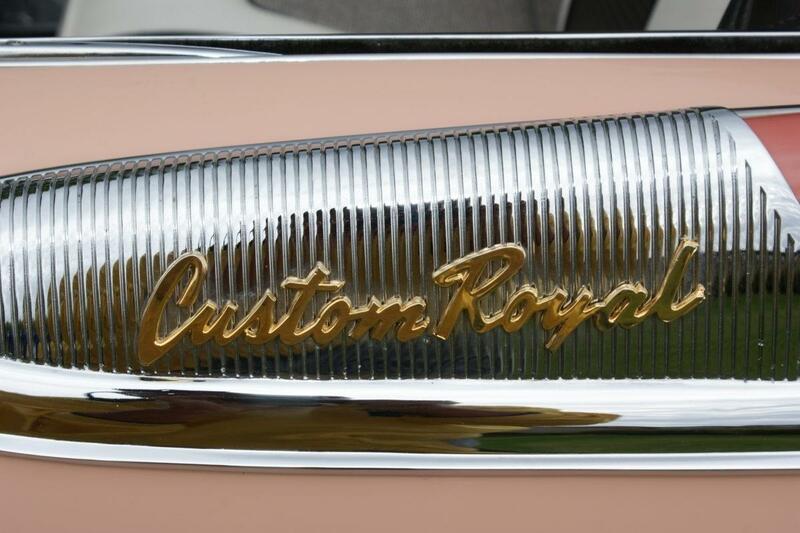 Custom Royals were some of the best performing cars on the road in 1959. At a cost of $1.24 a lb. compared to T-bone steak at $1.09 a lb. they were envied by many but sold only to a few The advertising slogan, “The newest of everything great the greatest of everything new” was nevertheless proved by the product. 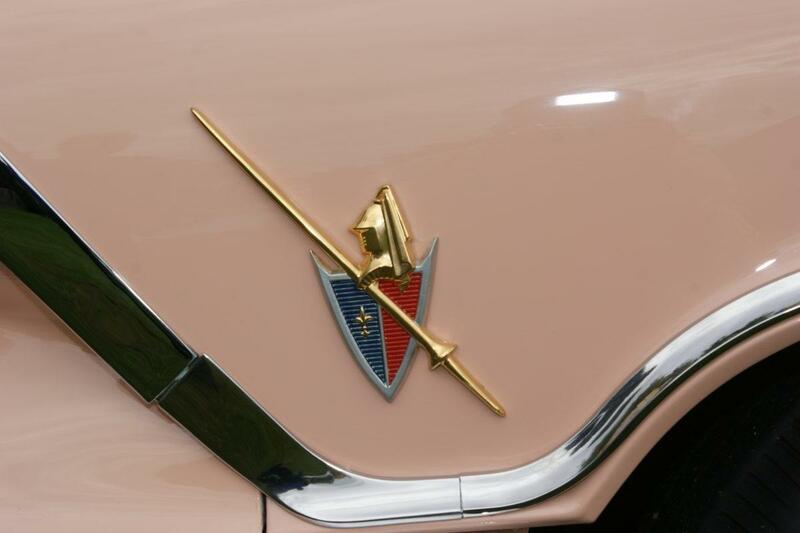 While Detroit design studios scrambled to outdo each other with more enormous, outlandishly finned bodies, dripping with chrome, the Dodge Custom Royal Lancers were the undisputed glitter queens. They were the elite of a class of dramatic styling that peaked in 1959. 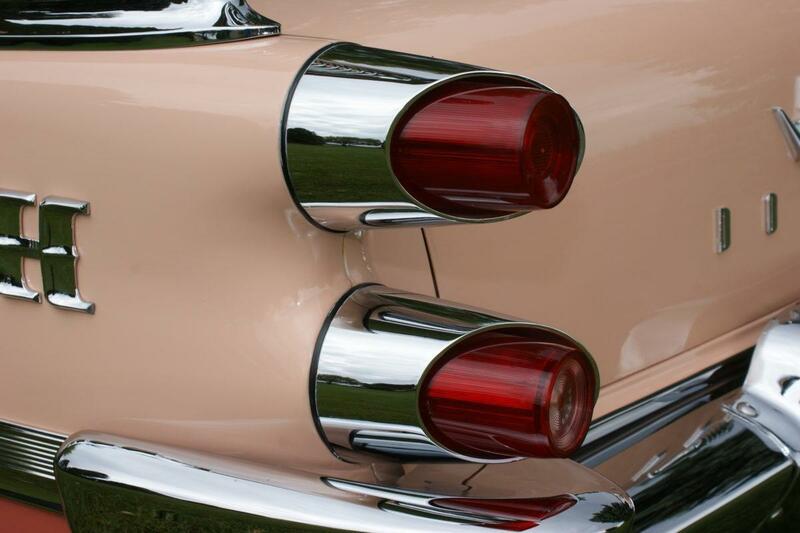 They wore more chrome than a ’59 Cadillac, and at least as much as a ’58 Buick. The jukebox-like dash, flashy multi-colored paint schemes, elaborate bright work, and enormous size (18ft.) were elements that made for sheer styling drama. From its scowling face with the famous “eyebrows” over the quad headlights to “flaming” jet-exhaust tail lights, this 1959 Dodge Custom Royal Lancer Convertible is as flamboyant as its extravagant name suggests. 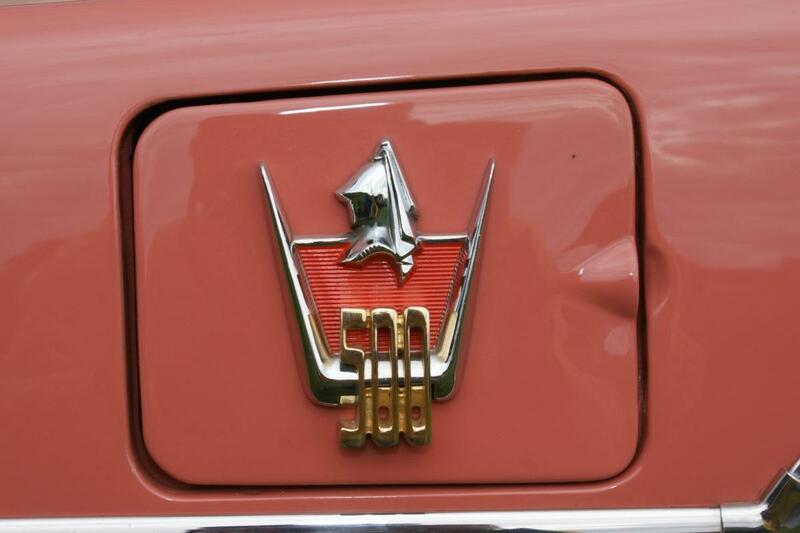 Invariably conversations about American automobiles eventually turn to the cars of the ‘50s and when they do, adjectives like “fabulous” “fins” “flash” “glitz” “glamour” “glitter” are almost always used to describe the period offerings from Detroit. To understand what drove Detroit to style these over-the-top cars, it helps to view them against the backdrop of the post WW II 50’s and the stylists/artists who used these automobiles as their canvass. Today car buyers tend to buy cars based on rational sensible factors like safety, reliable engineering and fuel economy. In the post-war 1950’s Americas buying decisions were largely based on conspicuous consumption fueled by planned obsolescence marketing. For the greater part of two long decades gloom and doom had cast a shadow over the country. With the war over and millions of soldiers returning home, gloom turned into an almost euphoric optimism. Celebrating the end of the austerity they had endured almost continually since the stock market crash of 1929, the public was in a buying mood. Since 1946, America was growing at the rate of about 4 million new babies a year and they would all need cars, lots of cars! Competition to attract buyers was fierce and often cutthroat. To appeal to the growing prosperity of the mushrooming middle class, cars needed to be more than mere transportation they needed to reflect the buyer’s social status and the popular culture of the times. Before the war automotive styling took a back seat to engineering. After the war the stylists and designers took the leadership role in selling cars. In 1949 Vergil Exner came to Chryslers advanced styling group. 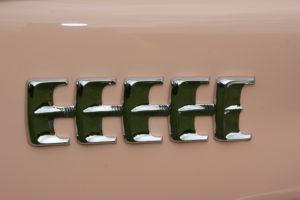 His illustrious pedigree included associations with the foremost automotive designers of the day including, GM’s Harley Earl who, inspired by the Lockheed P-38 Lightning fighter plane of WWII, incorporated small “fins” on the rear fenders of the 1948 Cadillac, Raymond Loewy, “the father of industrial design”, responsible for the Coca-Cola bottle and the livery on Air Force One and Luigi “Gigi” Segre, of Italian design studio, Carrozzeria Ghia. 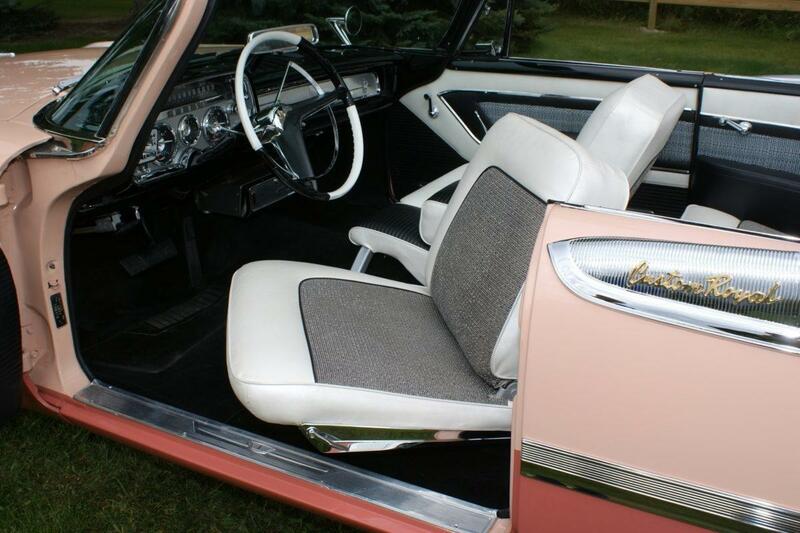 At Chrysler, Exner initiated the “Forward Look” design concept that emphasized a lower roofline with a long hood and short deck making the cars appear sleeker, smoother and more aggressive. He adopted Harley Earls “fin” concept and made it his own by enlarging the fins and featuring them more prominently. Exner also believed in the aerodynamic benefits of fins and even tested them in the University of Michigan wind tunnel, but the real appeal was in their striking visual effects. 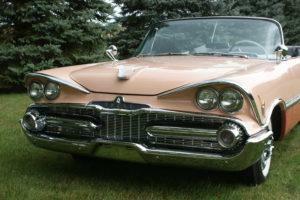 Nowhere in Chrysler’s lineup was the “Forward Look” more evident than at Dodge, with its “Swept Wing” series of full-size cars. 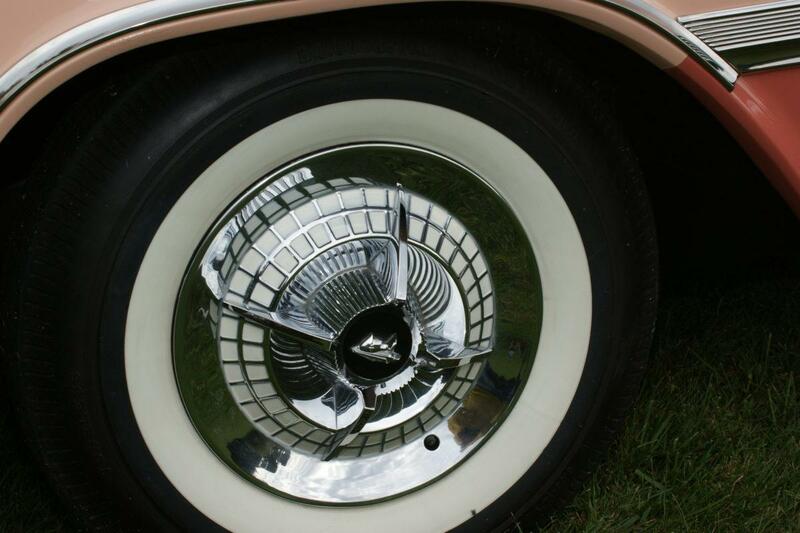 Suddenly Chrysler/Dodge was in the forefront of 1950’s era design, with Ford and General Motors quickly working to catch up. By the time Exner arrived at Dodge the Dodge Brothers had died unexpectedly in 1920, just when the company was ranked 2nd in auto sales. The company they founded with the vast fortune made over 15 years supplying chassis assemblies, engines, transmissions, and axles to Henry Ford was subsequently sold by their widows in 1925 to the investment group Dillon, Read & Co. for $146 million. At the time it was the largest cash transaction in history and, along with the $10,000 investment that bought them a 10% share in Ford Motor Company, proved to be one of the greatest returns on investment in business history (and a fascinating story on its own). Dodge went on to become part of Chrysler in 1928. The Dodge brand has withstood multiple ownership changes at Chrysler including its short-lived merger with Daimler-Benz AG from 1998–2007, its sale to Cerberus Capital Management, its 2009 financial bailout by the United States government and its subsequent Chapter 11 bankruptcy and acquisition by Fiat on June 10, 2009.